Do you want to revolutionize the face of Female Leadership? 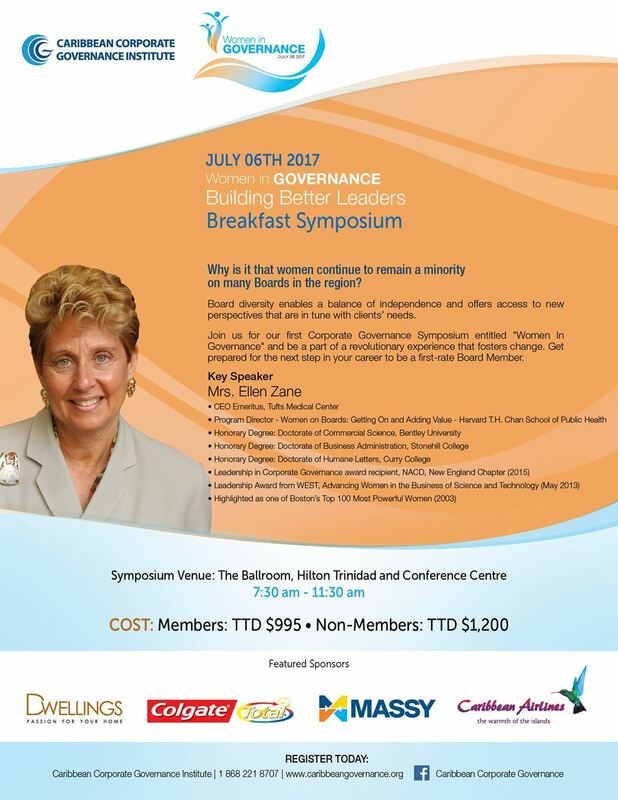 Be part of our first ever Corporate Governance Breakfast Symposium entitled "Women In Governance" featuring our Key Speaker Mrs. Ellen Zane. Get prepared for the next step in your career to be a first-rate Board Member. Be transformed and come mix with like minded individuals as you forge ahead in fostering change! Charged with a wealth of knowledge and experience, Mrs Ellen Zane was highlighted as one of Boston's Top 100 Most Powerful Women (2003) and is the Program Director of Women on Boards: Getting On and Adding Value at the Harvard T.H Chan School of Public Health. Don't miss out on this life changing event as we all work together in Building Better Leaders.